Two weeks ago I celebrated my 21st birthday and as a present, I asked my closest friends to invest in an entrepreneur in any developing country using Kiva, my new found love. I discovered the awesome of this organization a couple of months ago when I made my first loan to Tarcila, a woman in the Philippines who makes and then sells furniture (blog post here). Ever since then, I've wanted to get more friends involved in it. And my birthday presented itself as just the perfect introduction I'd been looking for. Shiyoen Chum groupThanks to the amazing generosity of my best friends of nearly 13 years (!!! ), five entrepreneurs from all over the world have been given the chance to develop their business and potentially lift themselves and their families out of poverty. From the Philippines to El Salvador and from Cambodia to Peru, our entrepreneurs are involved in all sorts of different trades and industries, including baking, transportation, fishing, and retail! It's pretty awesome stuff. LuciaMarisa chose Shiyoen Chum's family of fishermen from Cambodia because she wanted to invest in something that reflected health and nurturing. Val chose Aida who runs a motorcycle service in the Philippines because it struck her as a unique and innovative service. Carm invested in José, the baker from El Salvador, because she too is an aspiring baker. 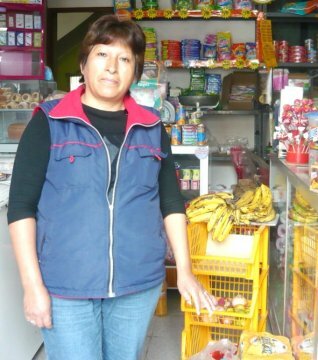 Cynthia chose on the basis of necessity, which Lucia's fruit and vegetable store provided for the members of her community. And finally, Gloria invested in Alejandra, who operates a buy-and-sell business, because she knew that Alejandra had to support three young children and would need the money to put them through school. Honestly? Listening to these reasons was one of the most rewarding parts of this little initiative. Why? Because it gave me a deeper glimpse into who these ladies are and for me, it was an affirmation of how well these ladies know themselves, as their choices brought to the fore aspects integral to their personality. So thus made my 2010 birthday! Who knew that this simple act of investing would reap so many wonderful rewards? Thanks ladies for actually taking the time to actually educate yourselves about the organization, the process, and the individuals that you invested in! So happy to be on this microfinancing journey with you! Two weeks ago I celebrated my 21st birthday (legality all over the world, holla!) and as a present, I asked my closest friends to invest in an entrpereneur in any developing country using Kiva. At first they asked me if I was sure that there was nothing else I wanted. Believe me, this wasn't some kind of selfless act, I asked myself that question long and hard too before making the ask. I won't deny it I am absolutely the kind of person who loves being spoiled and showered with gifts on her birthday. But honestly, this time around, there wasn't anything else I could think of asking for. I'm priveleged enough to say taht at this moment, I have evverything that I could possibly need and that there's nothing more that I want. It's an odd but incredibly liberating feeling! And so enters Kiva...my new found love. I discovered the awesome of this organization a couple of months ago when I made my first loan to a woman in the PHilippines who makes and buys furniture (blog post here) and ever since then, I've wanted to get more friends involved in it. And my birthday presented itself as just the perfect introduction I've been looking for. Hurray!! I've finally got around to doing something that I've been promising myself I would do for awhile now. As with so many things in life, we put it on the back burner and it stays there. But alas, I have made my very first loan on Kiva! Meet Tarcila. She's an entrepreneur who owns a furniture-making business in a small town in the Philippines called Ilagan. For over two years now, she has been selling household furniture within her local community. Tarcila plans on using the loans to buy raw materials to make more furniture and hopefully expand her business. For those of you who don't know what Kiva is or how it works, let me give you a quick run down. Kiva is a non-profit organization that facilitates the lending of money (with a 98.79% repayment rate!!) through the use of the Internet to microfinancing insitutions in various developing countries around the world. These microfinancing institutions then lend the money to small businesses and individual entrepreneurs. As for how it works, here's a pretty simple diagram that explains the process. Now why Kiva? Because I firmly believe in sustainability, in empowering people to lift themselves out of their dire living conditions by giving them both an opportunity and a platform to do so. The people living in these developing nations are some of the most resourceful and intelligent people our world has to offer and they are the very people we should and need to be investing our money in. It is they who will ultimately alleviate poverty for themselves and for their communities. So if you've got some dough to spare, make a loan today...it's easy peasy and you'll be doing some real, tangible good! Visit www.kiva.org today! A huge thanks to my friend, Andrea, whose blog post served as reminder and an impetus to lend ASAP.